Gluten-Free Diet Awareness Month takes place every November, and it’s an excellent time for you to learn how to make an aging loved one’s life with celiac disease easier. If you are a family caregiver to a senior with celiac disease, you know how important a gluten-free diet is to their health and well-being. Because there is no cure for celiac disease and the only treatment is a gluten-free diet, keeping your elderly relative comfortable and healthy is a real challenge. Family caregivers and their aging loved ones need to prepare for a serious lifestyle change when they receive a diagnosis of celiac disease. Fortunately, the information and resources provided during Gluten-Free Diet Awareness Month can guide them through the process. Why Hire Home Care Services Providers for Seniors with Celiac Disease? Because you want the best for your elderly loved one and know that they struggle to do many daily tasks for themselves, consider hiring a home care services provider. Not only will the home care services provider help plan gluten-free meals, but they will prepare and serve them. Healthy gluten-free snacks are also part of keeping seniors satisfied without risking their health. If your elderly relative depends on others for meals, a professional home care services provider is the right answer. Without properly managing their diet, seniors can suffer from uncomfortable symptoms like bloating, diarrhea, nausea, vomiting and fatigue. When they suffer long-term, it can lead to health issues like malnutrition, anemia and even gastrointestinal cancer. Following a strict gluten-free diet significantly improves their quality of life and boosts long-term health. Home care services providers can be on hand to make sure their diet is compliant. A gluten-free diet is harder to do than it first appears. Gluten is a protein found in grains like wheat, barley, and rye. This means that seniors must avoid anything with these grains. Bread, pasta, noodles, crackers, cookies, beer, cereal and pastries are all off limits. However, there are some foods where it’s more difficult to tell that they contain gluten. Mostly, the wheat flour is added in as a thickener, coating or as an additive. Some surprising sources of gluten include hot dogs, French fries, salad dressing, soup, sauce and some commercially prepared scrambled eggs. There’s even gluten in some unusual products like makeup, lip balm, vitamins, and toothpaste. With a professional home care services provider looking after your aging relative when you can’t be there, you can have peace of mind knowing that they are aware of your loved one’s celiac disease requirements. 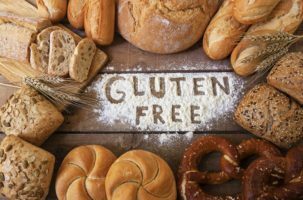 The more dependent that elderly adults are on supporters like family members and home care services providers, the more important it is for everyone to be on the same page about their gluten-free diet. During Gluten-Free Diet Awareness Month, you can get all the resources you need to ensure your aging relative remains free of the worst symptoms of celiac disease.